Trail volunteers install posts and signs marking the trail at the intersection of Fifth Street Sunday afternoon. OSAGE CITY—Around 100 volunteers devoted their Sunday to improving the face of Osage City. Crews of duty-free labor worked at half a dozen sites as early at 7 a.m. Sunday morning, doing their part to help the people, parks, buildings and leisure areas within the community. Harrelson’s church provided nearly 70 volunteers Sunday, some starting as early as dawn and working as late at 4 p.m. in the 100-degree heat. Parishioners had signed onto the project, stemmed from a seed given to church intern Ryan Mahoney, who got the ball rolling on the event. Church members were involved in clearing brush on the trail; painting at the ECAT, community and recreation buildings, along with the school football locker rooms; cleaning up the school courtyard; and working with senior citizens. Mahoney took the idea to the Osage City Council during its July 12 meeting. Karen DeOrnellas, Kanza Rails-Trails Conservancy, had also attended the meeting to speak on the Osage City trail project. DeOrnellas’ presence at the meeting had little effect on the council’s decision to abandon a paved trail project, but a conversation with Mahoney following the meeting proved fruitful in opening up the trail in town. Trail volunteers from the area, along with conservancy members from Alma, Wakarusa, Council Grove, Silver Lake and Abilene, pulled together with members of the church to put 40 to 50 people on the Flint Hills Trail route in Osage City, clearing extensive amounts of brush along the two-mile stretch, filling holes and marking the trail route with posts and signs. Beyond the physical work accomplished along the route, DeOrnellas saw it as an opportunity for residents to take personal ownership of the trail. Harrelson was even more pleased with the reaction of those who volunteered. Church members donating time Sunday came from all over the area, and the goal of the church stemmed past helping the resources available to them. Sunday’s progress went a long way in defining the Flint Hills Nature Trail route through Osage City, which was one of the less developed areas in county. Hurdles, however, still exist along the 17-block recreational course. With the city’s decision to discard plans to pave all or part of the trail, the conservancy hopes to further develop the face of the trail. Despite initial speed bumps, the conservancy hopes to become partners with the city in the continued development of the trail. Most of the Osage City stretch has been significantly improved for walking, bicycling and horseback riding. Setbacks to the project include a rail bridge near Fifth Street which needs repairs, along with the intersection of the trail with the BNSF railroad – both currently passable, but not optimal. 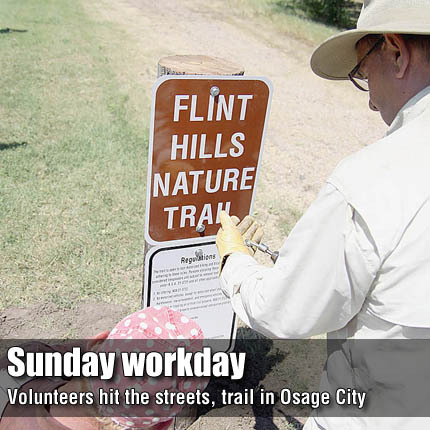 To help address local hurdles, the conservancy looks to develop a local group of volunteers and organizers to help continue to maintain and develop the trail in Osage City and the surrounding area. Sunday’s event helped bring several people together. DeOrnellas has begun working to find an area coordinator in Kareen King. King helped organize the work day, and joined in the work with church and trail volunteers Sunday. Purvis and DeOrnellas hope more locals will take on personal ownership of the trail.